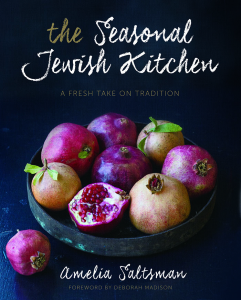 Celebrate Chanukah with award-winning cookbook author Amelia Saltsman's gorgeous roast chicken! To make your own silan (date honey/date syrup), check out her method here. 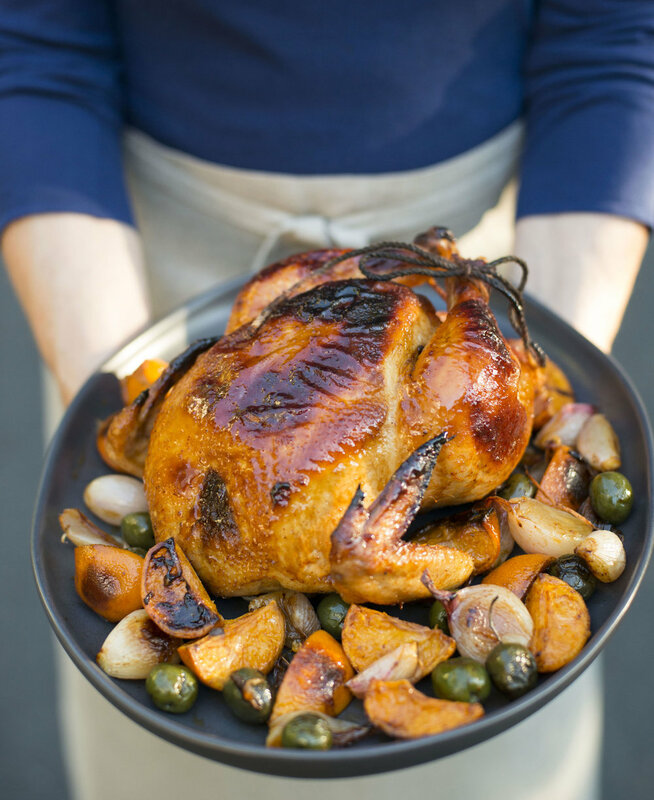 What a great way to celebrate the arrival of early winter citrus and the season’s holidays: tender roast chicken burnished with a sweet-hot rub of silan, or date syrup, and harissa, and perfumed with tangerines that are caramelized from their time in the oven. If you don’t like it hot, feel free to reduce the amount of harissa or substitute sweet smoked paprika. If you’re making this dish for a crowd, you can use the same weight in chicken parts (thighs and drumsticks work best). Use lightly brined olives, such as bright green Sicilian Castelveltranos, that marry well with the other flavors of the dish; avoid overly brined or sour varieties. This recipe will take you straight through the spring. Preheat the oven to 400°F (200°C). Pat the chicken dry. Whisk together 4 tablespoons (60 ml) olive oil, the silan, harissa to taste, and 1 teaspoon salt. Peel shallots and cut into quarters if large or halves if small. Cut unpeeled tangerines into quarters or sixths and poke out visible seeds. Scatter shallots and tangerines in the bottom of a large roasting pan and toss with a little olive oil and salt. Rub chicken inside and out with the harissa-silan mixture. Toss a few tangerine and shallot pieces into the cavity of the chicken. Place chicken, breast side up, in the pan and tie the legs together loosely with twine, if desired. Roast 30 minutes, baste with juices that have collected in the pan, and add the olives. Continue roasting, adding wine to the pan as needed to prevent the juices from burning and basting the bird once or twice more during the cooking, until the skin is a rich brown and the chicken is cooked all the way through, about 30 minutes longer. Transfer chicken, shallots, olives, and tangerines to a platter and tent loosely with foil. Place roasting pan on the stove top over medium heat, pour in 1 cup of wine, and stir to deglaze the pan, scraping up any brown bits. Cook until heated through, reduced, thickened, and glossy, about 2 minutes. To defat the juices, pour them into a fat separator or skim off the fat with a large spoon. Carve the chicken and serve with the shallots, olives, tangerines, and the warm pan juices. SHOPPING TIP: The word “tangerine” originally referred to a native of Tangier and has no botanical meaning. This type of citrus has many varieties, all technically mandarins. Some, such as early-ripening Satsumas, are commonly sold as “tangerines.” Since these are what you are most likely to find this time of year and since this dish has a North African quality, it seems appropriate to name it after the Moroccan seaport.